Samsung wants to make it easier for viewers to search and discover new content on TV. The company will begin shipping TVs with a completely rethought user interface called the Smart Hub experience in the coming weeks. Smart Hub aims to help users spend less time searching for shows and movies and more time actually watching them. The updated technology, which Samsung unveiled at CES and comes with a slew of new apps and features, will debut in the company’s upcoming line of 2013 TVs, which Samsung says is its sixth-generation line of “smart” (i.e. Internet-connected) TVs. The units will ship later this month in the U.S., starting with the LED 8000 and Plasma 8500 series. The event featured cameo appearances by Kate Upton, Eli Manning and Flo Rida. 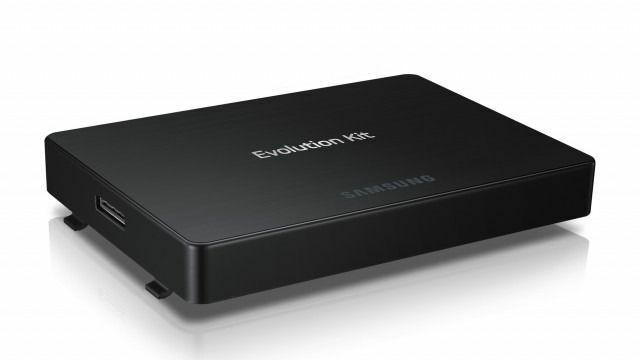 But perhaps one of the main stars of the launch was Samsung’s Evolution Kit, available in May for $299, which allows some owners of some 2012 Samsung TVs to upgrade without shilling out big money for a new TV. “The TV industry is undergoing a sea change in both content and technology. Although consumers can now access a plethora of content from myriad sources, finding and choosing their favorite content has become even harder,” Joe Stinziano, executive VP of Samsung Electronics America, in a statement. Samsung aims to change this, with a focus on its Samsung Smart Hub that offers five menu panels to help users manage and navigate content. It highlights what’s playing on the channel and makes suggestions on what to watch next. Called S-Recommendation, Samsung can make personalized recommendations based on viewing preferences and habits. Other bells and whistles include gesture control and Smart View, which lets users move content from the TV to connected devices and back in real-time without missing anything from the show. As for new apps added to the smart TV platform, users will be able to access the following on demand: Fox Now (which will feature shows aired on the network), music streaming service Spotify and billingual network Univision. There are a few other features Samsung is highlighting too, such as being able to organize personal media (video, music and photos) directly from the hub and display content from friends on social networking sites such as Facebook and Twitter. Samsung is also debuting a couple of new home audio systems with its 2.2-channel Giga Sound systems. The MX-FS8000 and the MX-FS9000 both tout dual 15-inch(!) subwoofers that deliver 2,300 and 2,560 watts of sound, respectively, as well as Bluetooth streaming, DJ effects and cool lighting. The MX-FS9000 will be available in May for $1,499 and MX-FS8000 will be available in June for $999. provide your views in comment about this technology. will this be the need or just hype? Thanks !! Keep looking at my blog. Hi there to every body, it’s my first visit of this weblog; this weblog includes remarkable and really excellent data designed for visitors. That is very fascinating, You’re an overly skilled blogger. I have joined your rss feed and look ahead to in the hunt for extra of your wonderful post. Additionally, I have shared your web site in my social networks! I was vastly delighted to attain this site proceeding google.I sought after to declare thanks to you with regard to this admirable article!! I certainlyliked all little fragment of it and I’ve you bookmarked to look keen on new ram you post. As I website owner I conceive the subject material here is rattling excellent , appreciate it for your efforts.